CSUSB students have a critical decision to make if they decide to drop out or take a gap year. If taking a gap year many students do so to get some real world experience. “The latest so far is 85 percent of students are continuing their studies,” said Muriel Lopez, Director of Institutional Research. Only 15 percent of CSUSB students actually drop out or take a “leave of absence” at CSUSB. Now students have the option of delaying their education to live their lives. “I took this last year off [to work on helping survivors of domestic violence],” said student Asia. Taking a “leave of absence” is not considered dropping out for CSUSB students. Instead it just a way of finding out if you are in the right field. “Leave of absence” means that the student will take a break from their studies. Instead of deciding to drop out they decide to take a break. Previously, it was a gap year to travel and see the world. Today it is useful for students to rest and recharge from the rigors coursework. Then when they choose to return to university, they are recharged and well-rested. Now it is almost a necessity to take time off for many students to achieve their dream careers. Some of the reasons that students make the decision to take some time off are the following; rising cost of attending college, injury or illness and prospective job opportunities. First, the massive financial debt that one acquires while attending university even at the state level at CSUSB. For example, working either part time or full time is a necessity for students to pay for books and housing which financial aid does not cover. However, not every student has financial struggles as reason for leaving. The fact that it is typically the cheaper alternative than a private institution. The four-year graduation rate is not that is not typical at CSUSB. The norm here is to graduate in about six years. 55 percent of students have a six-year graduation rate [currently], according to csusb.edu. Students in some cases have to drop out of their courses for health reasons. 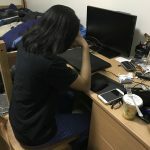 Dealing with family struggles such as death of a loved one or injury is a concern that many students deal with when they decide to take a break. “My mom was getting older so I decided to come back to this area,” said Tamara Holder, Osher Adult Re-Entry Center Coordinator. Dealing with familial struggles such as death of a loved one or injury are also possible reasons. Another huge reason for students to take a gap year are job opportunities. “She offered me an internship to work with rebirth homes,” said student Asia. “I built safe houses for battered women,” said student Asia. Working in their career choice prior to completing their education helps students. Even some people decide to take time off to live life and will decide that they want to return to their studies. “When I was in school, the world around me was different,” Holder said. Some students return when they have the opportunity to return. “I had no rent, mortgage, bill. I had to take advantage of this opportunity,” said Holder. Students willing to return to CSUSB to finish their education with a new understanding of their career choice. Even a deeper understanding of what they want out of life and college. Being fed up with math.